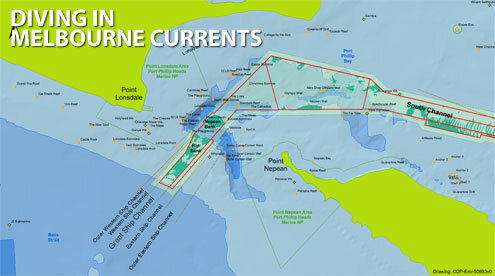 Many of the most popular dive sites in Melbourne are located just inside or outside "The Heads" of Port Phillip Bay. These areas are affected by strong tidal currents, which can exceed 17 kph (9 knots). Thankfully the strength of the tidal streams is reduced the further you travel from the heads. A map of The Rip and surrounding featuresThe area most affected is known as "The Rip", which is a dangerous stretch of water connecting Port Phillip Bay and Bass Strait. Because of large tidal flows through the relatively narrow channel from the bay to the ocean, and a high rocky sea bed, The Rip has claimed many ships and lives. Geographically, it is the roughly triangular area of water between the land points of Point Nepean, Shortlands Bluff and Point Lonsdale, these 3 form The Heads. 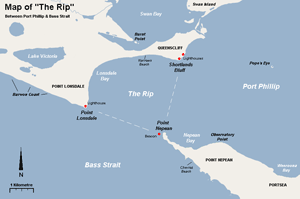 The entrance between Point Lonsdale and Point Nepean is 3.5 km wide but the reefs projecting from these points reduce the navigable width to about 1 km. Within 800m outside the Heads, there is a shallow rocky flat known as the Rip Bank. The water deepens outside this flat to 30m and inside the Heads to as much as 90 m. This inequality of depth combined with fast tidal streams causes the world-renowned dangerous conditions. The tidal streams stop every six hours or so, then turn and run in the opposite direction. The time between the incoming (flood) and outgoing (ebb) tidal streams is call "slack water". For many of the dive sites affected by the tidal streams, slack water is the only time diving is possible. The problem is, the length of the slack water period varies according to location, from day to day, and with weather conditions. While for many locations slack water usually lasts about 20 minutes, sometimes it may be only a few minutes, and sometimes it might be longer. As local divers you should quickly become acquainted with the following terms, and how they impact on your dive planning. Flood slack dives usually result in better visibility than ebb slack dives. This is because with a flood slack there is cleaner water coming into Port Phillip Bay from Bass Strait. To help determine what the tidal current is doing when waiting for slack water, experienced local dive boat owners and dive charter boats use a simple tidal indicator pip/buoy shot line setup. This uses three white solid styrene surface floats — a 150 mm diameter float at the far/surface end, then 1 metre apart is a 120 mm diameter float, then another 1 metre apart is a 100 mm diameter float. The Tidal Indicator Pip/Buoy Shot Line is dropped at the dive site. The large buoy drifts with the current on the surface. The two smaller buoys are pulled underwater by the current when the line tightens. When the current has almost stopped the first of the buoys floats to the surface. When the current stops, all three buoys should be floating on the surface. Sometimes, typically when the wind and current are in the same direction, the two current indicator buoys may not rise to the surface even when the current has stopped. Then it's time for a diver to be used as a sacrificial lamb! An experienced diver is put into the water to report on the current strength. Divers wanting longer run times will often start their dive with the current still slightly running. The following points should be taken into consideration by those unfamiliar with diving in the strong currents around Melbourne. Be geared up and ready to start your dive well before slack water is predicted to begin. It might come early! Be prepared to wait. Slack water might come late! Follow the shot line to the bottom. Try not to grab the shot line as this can move it away from the dive site making it difficult for other divers to locate the dive site. Get onto the bottom as quickly as you can with safety. Do not anchor your boat, or leave the boat unattended. If divers are swept away, the boat must be free to leave the shot line to pick them up. Plan your dive around twenty minutes of bottom time. Slack water rarely lasts longer than 30 minutes. If you find yourself caught in the current, do not fight it. You will soon become exhausted and you will use a lot of air. Shelter out of the current if you can. Use your hands or a reef hook to hold yourself in place. In a current, a smaller but faster fin kick may prove to be more efficient rather than big, unstreamlined kicks. If you are used to the "frog-kick" you'll have to change to a more standard, and more powerful, "flutter" kick. When the current begins (slack water ends), start your ascent. Ideally you'd start your ascent in the vicinity of the shot line, but again, don't actually hang on to the shot line. Decompression and safety stops are difficult and can be uncomfortable on a shot line in a current. Either plan to complete your decompression and safety stops before the current becomes too strong, or use you surface marker buoy (SMB) for a drifting stop. The Scuba Divers Federation of Victoria, Dive Industry Victoria Association (DIVA), independent dive clubs, and commercial charter operators require that all divers carry a delayed surface marker buoy (DSMB). We suggest a proper good sized DSMB and reel such that the DSMB can be deployed from depth, not a tiny "safety sausage" that can only be deployed on the surface. As well as marking the diver's location on the surface to the boat crew, the DSMB can be used to help control a drifting decompression or safety stop. We prefer to deploy our DSMBs from the bottom before we start our ascent. Thus the DSMB becomes an indication to the boat crew that we're starting our ascent, as well showing our boat and any passing boat traffic where we are. But many divers prefer to deploy their DSMB once they have ascended to between 15 and 10 metres of depth, or while doing their safety stop. Due to the restriction of the tidal range within Port Phillip caused by the relatively narrow entrance, the tidal stream at The Rip in the vicinity of the Heads does not turn at high and low water. The force of the tidal streams depends upon the relative water levels inside and outside Port Phillip. The greatest difference in levels occurs at about the time of high and low water at Port Phillip Heads. This is when the inward and outward streams run at their strongest, up to six knots under normal conditions and may exceed nine knots in extreme conditions. Slack water at Port Phillip Heads occurs at about three hours before and three hours after high water, which is when the levels inside and outside are the same. The ingoing stream runs from about three hours before to about three hours after high water and the outgoing stream at other times. Unfortunately nature does not always conform to a precise timetable. The water level and hence tidal streams can be significantly affected by barometric pressure and the direction and duration of the winds. West to south west winds cause a rise in sea level outside Port Phillip and a consequent increase both in rate and duration of the ingoing steam will continue till sea levels inside and outside have reached equality, then the increased ingoing stream will cease and the streams become normal. On the winds ceasing, sea level outside falls to normal, causing the outgoing stream to increase both in duration and in rate until sea level in Port Phillip has fallen to normal and the levels outside and inside are again equal. Tidal stream and slack water predictions for The Rip are available on the Bureau of Meteorology web site at http://www.bom.gov.au/australia/tides/#!/vic-the-rip. However these predictions are based only on the positions of the Sun and the Moon which are accurately known years in advance. Even in moderate weather, changes in atmospheric pressure due to highs or lows passing through Bass Strait as well as changes in wind strength or direction can change both the height of the actual tides (by +/- 25 cm) and the timing of slack water (by +/- 40 mins). These corrections are very difficult to determine in advance of a dive so the best advice is to aim to be ready to dive at least 40 minutes before the predicted slack water time. For Rip Bank, subtract 15 minutes from slack water at Port Phillip Heads. The tidal stream stops quickly here. For Londsale Wall and Nepean Wall use the published times for slack water at Port Phillip Heads. For Popes Eye, add 45 minutes to slack water at Port Phillip Heads. * Source: Shipwrecks Around Port Phillip Heads, by Stan Bugg and Bob Wealthy. Other contributions from highly experienced dive charter captains and local divers. Of course, the figures above will also vary with the tidal stream strength and weather conditions, so they can be used as a guide only. Some people disagree with the above slack water predictions. For example, the Port Phillip Sea Pilots say on their Environmentally Sensitive Sea Area (ESSA) web page, "The timing of the tidal streams is such that slack water occurs at almost the same time throughout the south of the Bay, e.g. the time of slack water at Hovell Pile Light will be the same as that at Port Phillip Heads." In its Victorian Tide Tables book, The Port of Melbourne say, "... slack water occurs at the Heads and in the South and West channels at the same time." For an alternative view of the slack water predictions, please see Port Phillip Heads Slack Water - Packo Predictions. Make of all of this what you will. Always use the methods described above in the section 'How Do You Know It's Slack Water' to properly check for slack water. Tides at Port Phillip Heads (Point Lonsdale) reduce in range from Bass Strait across Rip Bank and Nepean Bank to inside Port Phillip Bay. The mean high water springs for Rip Bank is 2.5m and for Nepean Bank is 1.8m. Inside the bay at Queenscliff, mean high water is 1.0m. Tides for Rip Bank and Port Phillip Heads (Point Lonsdale) may be obtained from Point Lonsdale Signal Station by VHF Channel 12. Tide and stream predictions are also published annually by the Port of Melbourne Corporation (PoMC) in the Victorian Tide Tables. The booklet is available late in the year for the next calendar year and can be purchased from Boat Books Australia. The Victorian Tide Tables provides times of high, low and slack water at The Rip (Port Phillip Heads) and times, direction and rate of maximum stream, i.e. when the tidal flow at the entrance to Port Phillip Bay changes direction. Tide stream signals are shown by night at the Point Lonsdale Lighthouse below the main light. Flood stream is denoted by one fixed green light for the first half of the flood and two fixed green lights vertically aligned for the second half of the flood. For the ebb stream, the first half of the ebb is denoted by one fixed red and the second half by two red lights vertically aligned. Tidal height information can be obtained by contacting the Point Lonsdale Signal Station by VHF Channel 12. When diving in Melbourne currents it's common to surface and find you and your dive buddy are quite a distance from your dive boat. So be prepared! Our recommendation is that all divers should carry a Delayed Surface Marker Buoy (DSMB) and reel on every dive, but especially on dives where strong currents are likely to be encountered. We recommend you shoot your DSMB from the bottom before you start your ascent. The closer you are to the dive boat when your DSMB is inflated, the more likely the boat crew will see it. RRP: $245, Our Price: $199, You Save $46 (19%). This is the best combination on the market. The Buddy Pocket Reel is wound with 45 metres of floating line, manufactured to AP Valve's own specifications for the optimum combination of strength and flotation. Simply attach the DSMB to the reel and you have a superb decompression marker buoy and also a buoy that can be used as a standard surface marker. Be prepared to complement the visual signal of your DSMB with an audible one if you surface and the dive boat is some distance away. The Dive Alert Plus is a popular surface/subsurface signalling device. RRP: $115, Our Price: $105, You Save $10 (9%). Another popular option for Melbourne divers is a Nautilus Lifeline Marine Rescue GPS, which enables you to send an AIS and DSC marine radio distress signal to your dive boat, plus ships, shore stations and other boats in the area. This device could save your life by alerting all suitably equipped, ships, shore stations and boats with a distress message with your GPS position. Continue to signal the crew until you are sure they have seen you. But remember that the boat crew may have other divers to pick up before they can come to you, so stay calm, keep your mask and snorkel in place, and try to maintain eye contact with the boat. If you are with your buddy, stay together. If you are not experienced with diving in a current, make sure you go with an experienced local dive guide or dive buddy who can read the conditions and advise you accordingly. Most of all, stay safe and enjoy your diving in Melbourne currents.